We are writing to announce the appointment of Linda Liau, M.D., Ph.D., M.B.A. as Chair of the Department of Neurosurgery, effective August 21, 2017. Dr. Liau was selected for this position following a national search. She has been serving as Interim Chair since January 1, 2017. An internationally renowned surgeon, scientist and educator, Dr. Liau is presently Professor in the Department of Neurosurgery. She also directs the UCLA Brain Tumor Program, one of the world’s leading centers for brain tumor research, diagnosis and treatment. Dr. Liau is internationally known for her pioneering research on clinical neuro-immunology and brain cancer immunotherapies. She is the Principal Investigator of a recently awarded National Cancer Institute Brain Tumor SPORE, which is a $11.4M grant that supports a large multi-disciplinary group of scientists and clinicians in their efforts to diagnose, treat and cure brain cancer. She is the current Editor-in-Chief of the Journal of Neuro-Oncology and a member of several prestigious organizations including the nominating committee of the American Association of Neurological Surgery and the Board of Directors of the American Board of Neurological Surgeons. Dr. Liau holds B.S. and B.A. degrees from Brown University. She received her medical degree from Stanford University and completed residency training in neurosurgery at UCLA. Dr. Liau also received a doctoral degree in Neuroscience at UCLA and an M.B.A. from the UCLA Anderson School of Management. Dr. Liau's clinical expertise is in intraoperative functional brain mapping and use of intraoperative adjuvants for the resection and treatment of brain tumors. Her research efforts are focused on the molecular biology of brain tumors, gene therapy, immunotherapy, and brain cancer vaccines. 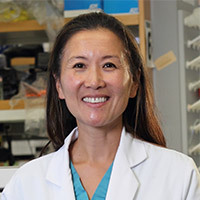 Dr. Liau has also served as a co-leader of the DGSOM Neuroscience Research Theme since 2013, where her efforts have helped in the development of strong interdepartmental research program in neuroscience. Consistently ranked among the top neurosurgery departments in the country according to U.S. News and World Report, the UCLA Department of Neurosurgery is deeply committed to its tripartite mission of providing world-class patient care, translating innovative research into medical breakthroughs at the bedside, and educating the future leaders of tomorrow. With the UCLA Brain Injury Research Center, the UCLA Stroke Center (one of only eight centers in the country with funding from the NIH SPOTRIAS grant), the UCLA Brain Tumor Center (one of only five centers in the country with NIH SPORE grant funding), and the UCLA Spine Center, the department is engaged in exciting research efforts and personalized care, bringing biomedical scientists and surgeons together in the quest to tackle a wide array of diseases including brain tumors, stroke, aneurysms and arteriovenous malformations, traumatic neurologic injury, epilepsy, movement disorders, spinal cord injury and spine disorders. In announcing this appointment, we wish to thank the members of the Search Committee, whose names are listed below. Their dedication and commitment to the process were essential for the result that has been achieved, and our entire School owes them a debt of gratitude for their hard work.